May 12, 1938: Judy admires her rivals. May 12, 1939: Judy’s first day of filming on Babes In Arms with Mickey Rooney. The two filmed the “Good Morning” song on the “Interior Randall’s Office” set. 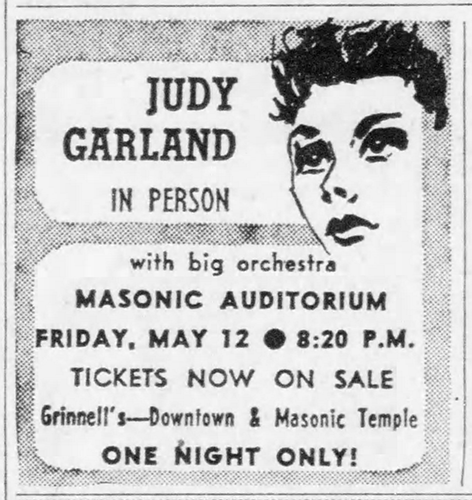 Per the assistant director’s notes: “JG – Time called 9 a.m.; arrived on set at 8:52 a.m.; 9:14-9:20 – wait for Judy Garland, putting on wardrobe; 9:30-9:44 – fix Judy’s makeup and hair, lunch was from 12:30-1:30 p.m.; time dismissed: 5:40 p.m.
May 12, 1941: Judy gets her wish. Though Judy plays her first “glamour girl” role in “Ziegfeld Gir” now at Loew’s, she is still a little put out because the romance in her film life is still of the puppy love variety and does not permit her a single kiss from her beau, Jackie Cooper, throughout the film. Lana Turner kisses or is kissed by James Stewart, eight times, and by Ian Hunter twice; Hedy Lamarr kisses Phillip Dorn five times and Tony Martin once – but Judy goes kissless. Photo above right provided by Kim Lundgreen. Thanks, Kim! 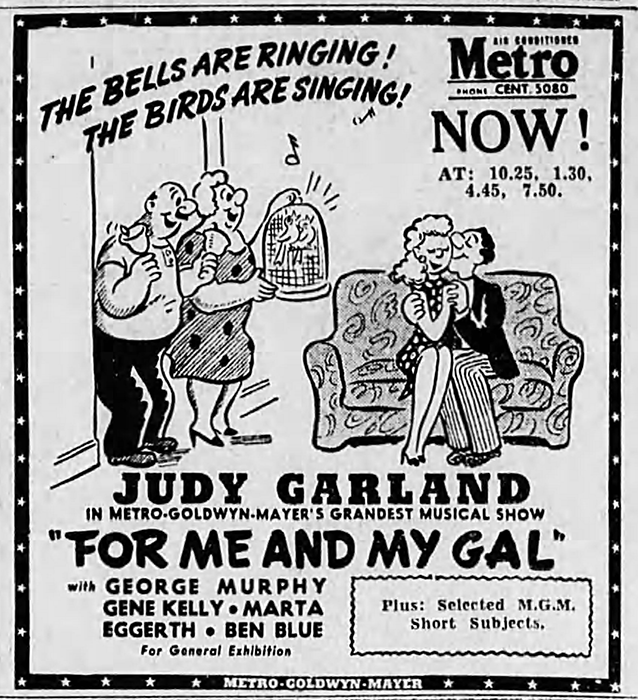 May 12, 1943: For Me And My Gal was still playing in theaters around the country and the rest of the world, as this fun advertisement from Melbourne, Australia’s “The Age” newspaper shows. 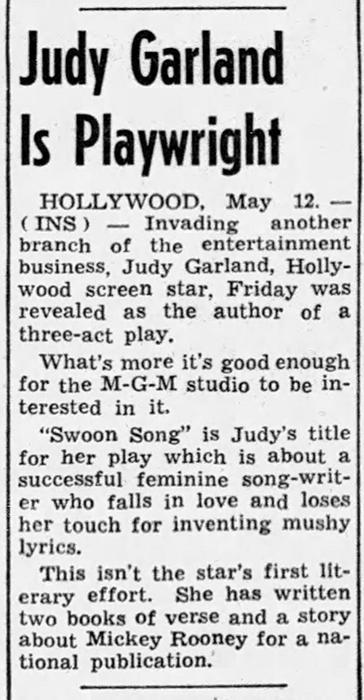 May 12, 1944: Judy Garland, playwright/author. 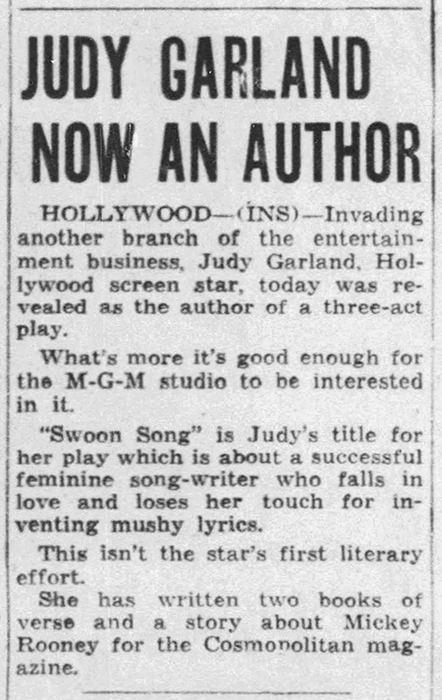 The news of Judy allegedly writing a three-act play titled “Swoon Song” was in the Hollywood columns. This is yet another example of the very active MGM Publicity Department. May 12, 1945: The last day of a rare three-day break for Judy during the filming of The Harvey Girls. Judy had no other professional obligations during this break. May 12, 1947: Filming on The Pirate continued with scenes shot on the “Interior Manuela’s Bedroom” and “Interior Sebastian Hotel Bedroom” sets. Time called: 9:45 a.m.; dismissed: 6:20 p.m. THE RELEASE from Capitol of an album by the one and only Judy Garland is something to crow about – particularly when the LP is the finest she has ever turned out. In arrangements, orchestra backgrounds and individual interpretation, the storm=ridden Judy has never appeared to better advantage on record. She possesses an incomparable showmanship, the kind that wins lifetime fans. Her personality is part and parcel of her talent. She doesn’t, she can’t get lost in the crowd. The Garland girl’s 11 numbers bunded in a misty, elegant package called “Alone” will hardly get lost in anyone’s record library, either. Judy’s musical imagination evokes a melancholy atmosphere through both sides of the LP. She becomes a solitary singer, hitting the intimate mood and emotions of a real torch singer. 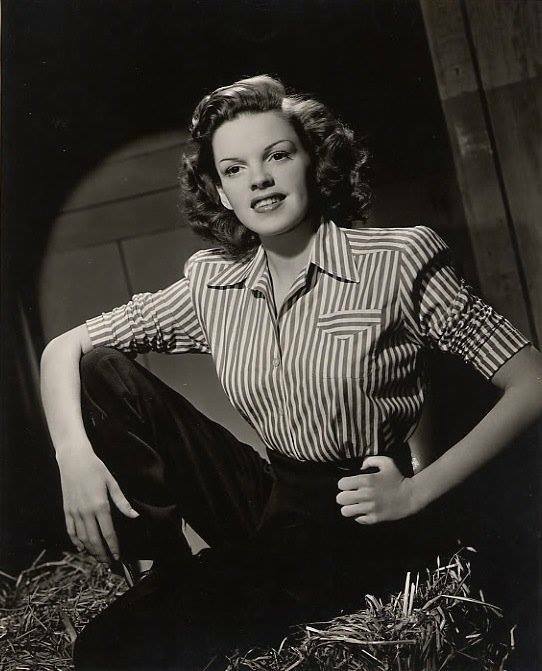 Check out The Judy Garland Online Discography’s “Alone” pages here. Liza Minnelli on stage with her mother, Judy Garland, at the Flamingo in Las Vegas, May 1957. Also on May 12, 1957: This article by Harold Heffernan was published. Judy was in the middle of a three week run at the Flamingo Hotel in Las Vegas, Nevada. 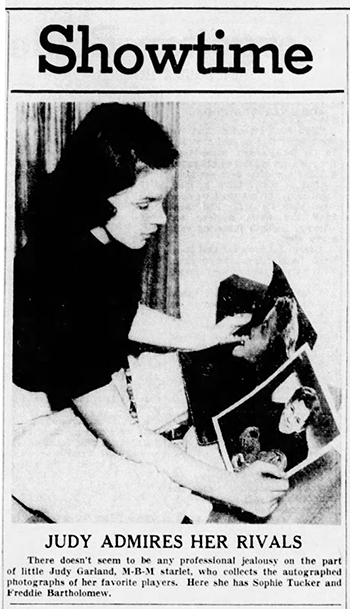 It’s interesting that the paper chose to run a photo of Judy from the early 40s. HOLLYWOOD – Just before taking off to break in a new nightclub act at the roughest proving ground of them all, Las Vegas, Judy Garland offered a couple of pointed suggestions to the ever-increasing crop of new singing sensations now sweeping into the clubs, the TV airways and Hollywood movies. In a chatty and occasionally reminiscent mood between rehearsals of the expensively dressed variety show she is breaking in at Vegas’ Flamingo Hotel, the one-time teenage darling of the MGM lot was bursting with plans not only for a continuing nitery tour, but for more television specials and a motion picture feature. None of these is in a form tangible enough to be discussed just yet, she said. In Judy’s “I Remember” moments, she was recalling those exciting days when as a mere kid of 15 she was going to school on the MGM lot along with Deanna Durbin, Freddie Bartholomew, Mickey Rooney and other “name” youngsters of that era, and how Mickey taught her most everything she came to know about acting in front of the camera – or in front of anything else, she added. That made her pause and ponder – hard, Judy said, before long she was vastly improved in both voice and delivery; simply by putting Mickey’s words into action. And, she recalled, it wasn’t many weeks after when she was ushered into a recording studio to sing the undying Garland theme song, “Over the Rainbow.” When he heard it play back Mervyn Le Roy, directing her in “The Wizard of Oz,” commented: “That little girl’s vocal chords are heart-strings. Dressed in black silk tights over a pair of legs that would cause Jayne Mansfield to stare and a floppy black silk jacked, Judy breezed through a final practice routine in a rental hall before boarding the train for Las Vegas. Meanwhile, as this advertisement from Tucson, Arizona’s “Arizona Daily Star” shows, MGM was marketing its film catalog as television events. They certainly were! How many of us out there still remember staying up all night, or even calling into work “sick,” to catch a Garland film on TV? In those pre-cable, pre-home media, pre-Internet years we scoured every TV Guide and newspaper listing hoping for showings of Judy’s films. It’s all we had! 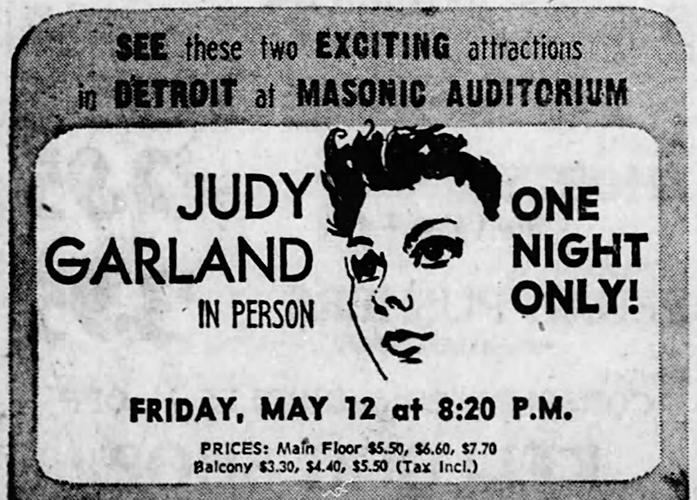 May 12, 1961: Judy’s 1960/1961 one-woman-concert tour took her to The Masonic Auditorium in Detroit, Michigan. Judy had recently given her concert at the Sam Houston Coliseum in Houston, Texas for a whopping 9,400 people in attendance. JUDY GARLAND is coming to Detroit for a one-woman, one-performance show at Masonic Temple Friday. Miss Garland is etched in our memory as a gay child from “The Wizard of Oz” who sang some lasting songs and disported herself to some fickle fame with the Straw Man, the Tin Man and the Cowardly Lion. But this is considerably “Over the Rainbow” – some years have passed during which we have grown some grey grass above our years – and Miss Garland, from the young star of such other movies as “Meet Me in St. Louis,” has had the bitter and the sweet. SO WHAT NOW about her riding the crest again – with movies and concerts, having just wowed them in Carnegie Hall? So we picked up the phone and there was Judy’s voice, young and buoyant with the upbeat of success again in it. It was drizzling in Detroit but the sun was shining in New York – an omen of rise and shine – and from such amenities as the weather we passed on to other things. SUCH AS the night we accompanied a trainload of stars, including her, from Chicago to Detroit and sat up all night playing poker with a couple of male stars and a famous cameraman. Judy had forgotten it of course – she was just a child then – but we remembered it fondly, having won $31 because that cameraman kept betting into pairs showing. THE CRITICS had enthused about her Carnegie Hall appearance, but what about her return to the movies? In “Judgment at Nuremberg,” her first picture since she made “A Star Is Born” six years ago? “It was wonderful working in it,” Miss Garland said. HAS IT LED to other things? “Oh, yes,” she enthused. “I’m making three more movies. You have your own movie company? “Yes, ‘Kings Row’, in London,” she said on. It turned out that Judy Garland – now somewhat separated from Hollywood – maintains homes in both New York, where her children go to school, and in London, from which base the family takes junkets in Europe summers. You’re going into a play? Did she like movies – high revenue for a star – or playing to live audiences better? WAS IT true she knocked herself out playing to live audiences – such as when she comes to Detroit? THERE WERE children’s voices now in the background, coming home from school – Judy’s three are 15, 8, and 5, she said – and we decided this was a happy note on which to say goodbye. For stars are born – they have their personal tragedies – they come and they go – they all have their personal tragedies – they come and they go – they all have a compulsion to please us and knock themselves out trying – and they have their happy times when they’re high riding the tide. They can’t be happy winning $31 at poker.